The Filters screen is part of the Photoxor C1 toolkit since its first release. 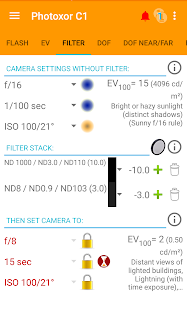 It provides the calculation on how to correct the camera exposure settings when adding neutral density filters. Measure the light situation without filters attached.Apply the filter stack. Get the new camera settings with filters attached.The calculation retains ISO and aperture settings, and adjusts the exposure time. Optionally, the calculated settings can be adjusted, and a lock may be used to keep a value from changing.For example, you may lock aperture to retain the aperture setting (i.e. aperture priority). 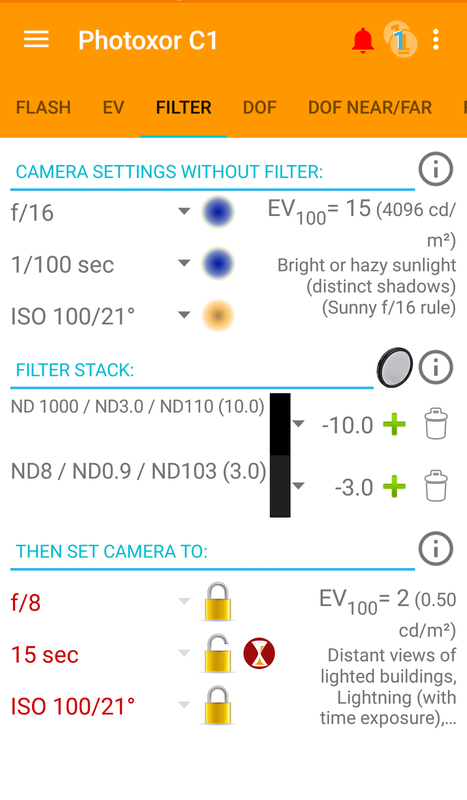 Up to now, all locks on the filter screen are released as soon as you change either the values of ‘camera settings without filter’ or modify the filter stack. Version 1.5.3 of Photoxor C1 will change this behaviour slightly and not release locks on changes to the filter stack. Why will this be useful? In addition to above ‘standard’ workflow (where we are able to adjust aperture, exposure time, ISO settings), we are now able to also change the filter stack to adjust our exposure target and retain locked values! Measure the light situation without filters attached. Apply the initial filter stack. Now you receive the result settings. Set the result aperture to your preferred value, and set the aperture lock. Set the result ISO to your preferred value, and set the ISO lock. This will result in a calculated exposure time value (which can’t be changed as the other two values are locked). Now adjust your filter stack to achieve the desired exposure time. Both aperture and ISO remain fixed, only exposure time will change accordingly. Please let us know what you think about this new workflow. Is it useful for you?